Achieving the ambition of the Paris Agreement requires deep emission reductions across all sectors, including forests. However, forest contributions have sometimes been ‘discounted’ by policy makers, climate negotiators, and groups that claim forest mitigation is not permanent and therefore should not be considered on par with emission reductions in, for example, the energy sector. This report suggests otherwise, arguing that, to the atmosphere, avoiding emissions from deforestation and forest degradation is no different than avoiding a fossil fuel emission. There is 40% more carbon stored in forests than in fossil fuel deposits. If we are to avoid dangerous climate change, primary forests with their high long-term average carbon stocks must be protected, degraded forests must be regenerated, and lost forest areas restored. 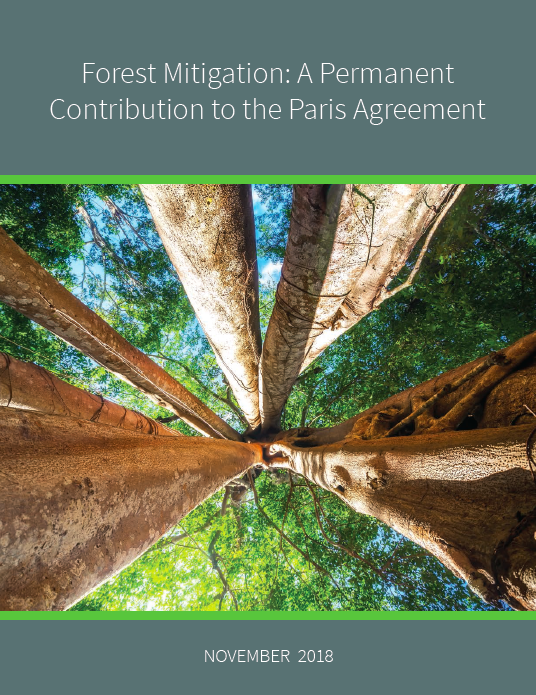 Funding for this report was provided primarily by the Norwegian International Climate and Forest Initiative, with support from the Climate and Land Use Alliance. The authors are solely responsible for its content. Suggested citation: Federici, S., Lee, D. and Herold, M. (2017). Forest Mitigation: A Permanent Contribution to the Paris Agreement.